It’s uniquely formulated to lighten the appearance of sun damage, age spots, liver spots, freckles and melasma, while also smoothing fine lines wrinkles, and improving the overall evenness of skin tone. Recommended for mild, moderate to severe hyperpigmentation. Remove and discard white cap and replace with dropper. Place two to three drops in palm of hand and use fingertips to apply a thin layer to face, décolletage, chest and back of hands as desired. Use both am and pm or as directed by a physician. Sheer Broad Spectrum SPF 45 is a silky, soft and weightless pharmaceutical-grade sunscreen. 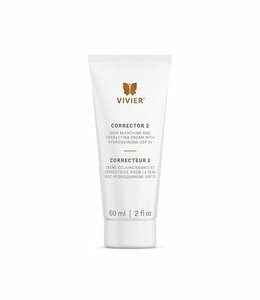 Corrector 2 is a gentle yet effective pharmaceutical grade skin lightening and correcting cream.